A Fun Way to Pay Off Debt Faster! In my last post I shared my Simple DIY Budget Binder, or what I like to call my Money GPS because it gives us direction to reach our financial destination. Part of reaching that destination is becoming debt-free. After over 10 years of being debt-free we now owe over $18,000, much of which is medical debt from two years ago when we had no health insurance, and bills that were not covered by insurance from my daughter’s accident in October 2014 and my subsequent auto accident in February 2015 when a drunk driver rear-ended our car (which totaled it) and ran off into the woods. While my daughter and I have recovered well, our finances haven’t. 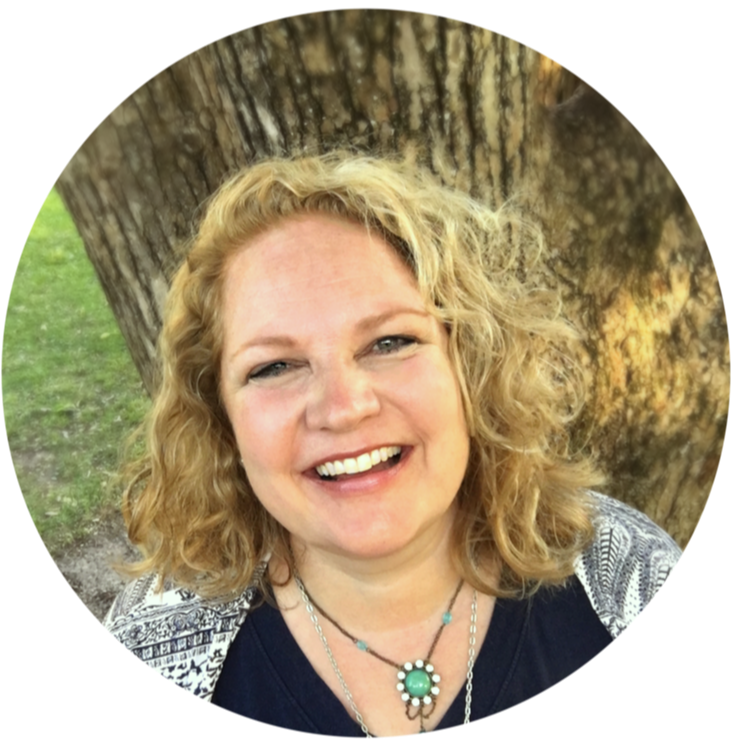 When faced with such huge numbers it’s easy to become discouraged but I decided to make our debt payoff into a game which is much more motivational and encouraging than thinking about the overwhelming weight of the debt. Note: Before beginning our debt repayment plan we saved $1000 into an emergency fund, which is even more crucial in our circumstances because we don’t have credit cards to use in the event of an emergency. The name of the game is Debt Blaster and it helps us stay motivated to pay off the debt as soon as possible. First print off the Debt Blaster Page. Next write your debts on individual colorful sticky notes. If you have many debts you can use more narrow sticky notes than what I used in the photo above. 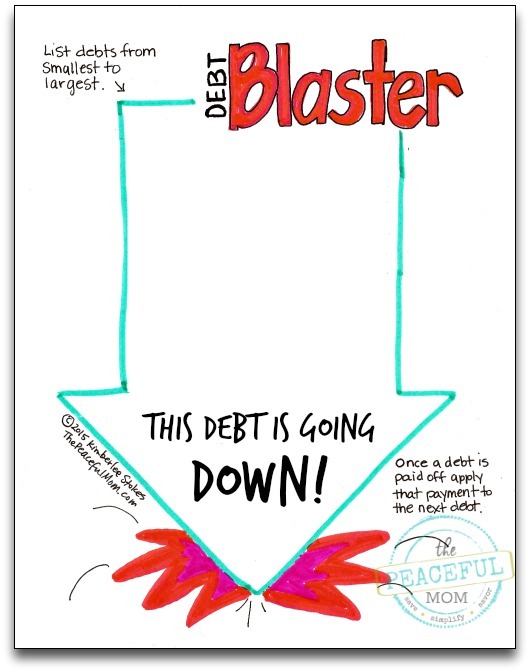 Place the sticky notes on the Debt Blaster Page in order from smallest to largest. Now it’s time for the fun part. Take every bit of extra money you can find or make and use it to pay down the first debt. Each time you make a payment place a new sticky note with the lower amount you owe on top of the old note. It is very motivational to see the amount of money dropping as you pay off more and more each month. Once the debt is paid off remove those notes and move debt #2 to the top of the page. Continue until all debts are paid off. 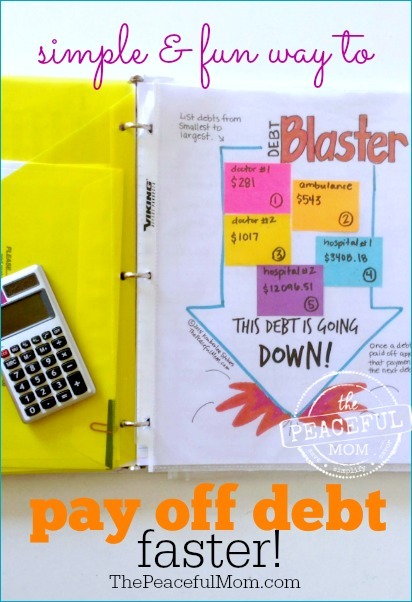 You can place the Debt Blaster Page in your budget binder or place it on the front of the fridge so everyone in the family can get involved! You can print the blank version and use sticky notes as I have, or print the lined version and write out your debt repayment plan. Place the plan in your binder or in a visible location like the front of your fridge to remind you of your goal to be debt-free. 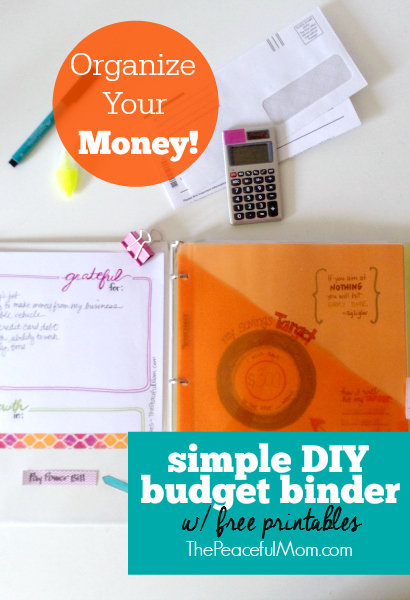 See the entire DIY Budget Binder HERE. You took dave ramseys plan and made it your “own” without crediting him. Thanks for taking the time to comment Carrie! Actually the idea to pay off the smallest debt first originated long before Dave Ramsey came along. Dave took the “debt snowball” idea and phrasing from a woman named Mary Hunt who first coined the term. I am simply taking the idea and adapting it to work for me. If it doesn’t work for you, don’t use it. Have a nice day! Hi! 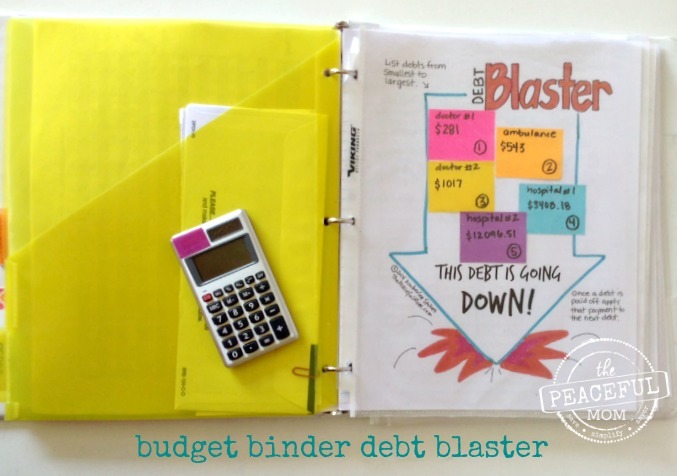 Just found your site and love this Budget Binder Debt Blaster! Excited to get started and am printing pages and setting up my binder. I’m not sure if I missed it somewhere, so forgive me if you’ve shared this, but what other items do you recommend keeping in the binder? I notice you have other items in yours, and wondering what other components may be helpful or necessary. Nice idea! But I suggest: put the debts in order of interest rate, not size. You want to pay off the loan with highest interest first. Thanks so much for taking the time to comment Robin. Yes, it does make more sense mathematically to pay off the highest interest loans first but finances aren’t always just about the math. Sometimes it is more motivational to grab a quick win by paying off a loan with a smaller total payoff then to applying the payment you were making on that loan to the next biggest loan. I love this idea. I use a debt chain (that I’ve shared on my blog) but this would be very motivational too!